“It came about because conservation is a white, male, dominated space. Frankly, we were fed up with that. We are in Zambia, and Zambians need to feel or take ownership of wildlife. And, if it is a very segregated space then that’s not going to happen,” she told Conservation Careers. “The few women who work in conservation sometimes feel isolated, especially the ones who are in remote areas. If we don’t make attempts to get to know each other, we often go years before we realise that we work in the same space, and we all want to achieve the same goal,” she explained. For women looking to get into conservation, or those who are already in roles but want to expand their opportunities, Luwi suggested starting your own networking event, or joining existing ones, to leverage these relationships. The events average at around 40-50 people and is growing. “Now we are getting people who are not involved in conservation but are really interested in opportunities. I think it goes back to the idea that Zambians are not interested in conservation. They are, they just don’t know how to get involved!” she said. Luwi is familiar with some of the gender stereotypes faced by women in the industry. Her role at Women for Conservation means she is often put in positions where she must balance job expectations against cultural norms of the female role. “At the end of the day, I am still a young Zambian woman. In meetings with older Zambian men, I am often expected to behave in a certain way… On one side I have to be respectful, polite, speak when spoken to, not be too aggressive, not be intimidating or arrogant; because sometimes being a woman and simply speaking your mind comes-off as arrogance. Then I must get the job done, be assertive and not take no for an answer and, despite this, achieve success. That has been a challenge,” she admitted. Luwi is not someone who backs down lightly, however. During university she switched from medicine to conservation – a role she felt better suited her inquisitive nature. To succeed, perseverance is key and comfort zones need to be pushed. And, as more women join the industry, their collective voice gets louder and harder to ignore. “Trust the process. I know it sounds deep and yet vague at the same time, but that hard work pays off. I had no idea that I would be where I am today. But I did put in the work, I did the internships, I volunteered when I could. Every step will take you one step closer to your dream,” she said. “Take education seriously, get a degree if that is what you need to do to be in this sector. But, be open to different opportunities and open to learning,” she added. Luwi did, however, acknowledge that a lot of the conservation world is privileged to have been able to afford the education fees often required to get your foot in the door. But, for those who are not as fortunate to have these opportunities then she recommended proving your passion. “Oftentimes organisations are interested in people who are passionate. If you love what you do, it compensates a lot of the challenges you meet along the way. Find projects you can be part of in spite of the fact you are not academically qualified. You don’t have to be very academically qualified to work at an elephant nursery or to be part of a litter-picking campaign, she said. “And, in some ways, the fact that you are not highly-educated means you are able to connect with the community around you in a better way. Sometimes in education you get so wrapped-up in your books you do not know how to have a conversation with a regular person from their standpoint,” she added. As a programme, the WCP, working alongside the Department of National Parks and Wildlife (DNPW) have two main goals. The first is to educate Zambians on the value of wildlife and the second is to make them understand the consequence of wildlife crime. Part of it is through behaviour or awareness campaigns, which is what Luwi leads. As well, the Women for Conservation support the DNPW with intelligence-led investigations which then lead to arrests and convictions. “We are seeing more young Zambians taking ownership and seeing them excelling. We have been running for two years and we are starting to see the change. Part of what we do is monitoring the media. It is cool to see more conservation stories being reported,” she said. Luwi’s job is to work with media partners to get the word out, to make people realise why conservation matters and why, if wildlife laws are broken, it will lead to severe punishment. It is hoped that from the media detailing examples of the consequences it will deter others from committing crimes. In 2018, two rhinos were poached in Livingstone and the attention from the local media cemented the notion that attitudes were changing for the better. “From when the rhinos were killed, to when the suspects were arrested, to the fact that the sentence was more than the minimum. It was cool to see people wanting to be part of the story and report on something other than politics. But, I think we have a lot of work to do and we won’t be done until everyone is talking about the environment. These issues need to be as important as everything else on the national agenda,” she explained. Already the networks that Women for Conservation have created are starting to bear fruit. Because of a connection through this programme, Luwi was introduced to Noel Kok. In 2018 he was launching a South African film Festival: Nature and Environmental Wildlife Filmmakers (NEWF). 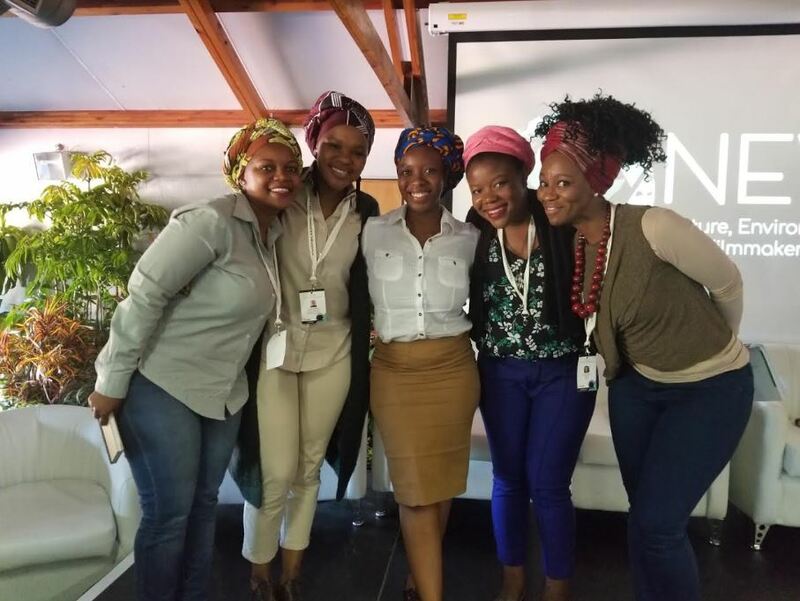 “He wanted young women from all over Africa to sit on a panel and talk about what it is like to be a young, black, woman in this space,” said Luwi. A couple of months later she flew to Durban to sit on the panel. “I was so inspired by him and what he was doing with his support for young Africans. If conservation is elite, then wildlife conservation filmmaking is even more so. He was telling regular stories from an African standpoint,” she said. Shortly after, he was on stage at the Conservation Careers Conference, another Women for Conservation initiative. The aim of this event is to cultivate an environment to attract young Zambians to participate in conservation as a viable career path. “It is really important. A lot of young people do not think it is accessible. Our universities are churning out graduates’ year-after-year, but if all of them end up going to work in different sectors because they do not think conservation is something they can do, then we have a problem” she said. “Noel’s talk was testament that so many things are working. Conservation for women, Conservation Careers conference, and now networking – not just in Zambia, but across the continent. It cemented that our idea was legitimate. “My legacy will be seeing as many people as possible getting into conservation and seeing diversity. Whether that be diversity in colour, in gender, ability or background. We can only benefit from having as many people in as many different walks of life be part of conservation,” Luwi said.